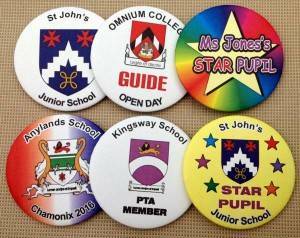 Our experience in producing party badges is put to good use when it comes to our range of school badges. 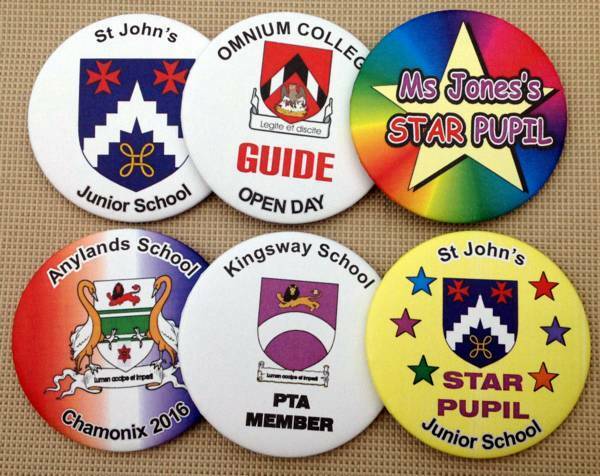 We supplied our first set of badges to schools nearly 20 years ago, and since then we have supplied badges for school events, school trips, PTA, open days, awards and rewards. 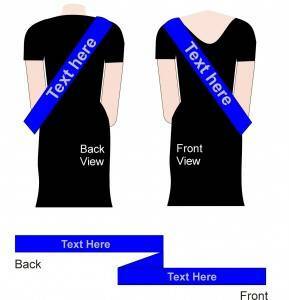 In addition our sashes are always popular purchases for prom nights, and wristbands for school trips. We also have a range of school chess sets, starter sets as well as Tournament Chess sets. All chess sets are hand made and available at great prices. Get a full colour badge including your school logo. Each badge can be customised with your own wording. And there is no minimum order. Standard prices apply irrespective of the amount of text. Your school coat of arms or logo can be included at no extra charge. Ideal for PTA, school speech days, open days , school events, visits and school outings. Available in different sizes. Orders posted in 1-2 days. Further information on badge sizes can be found here. 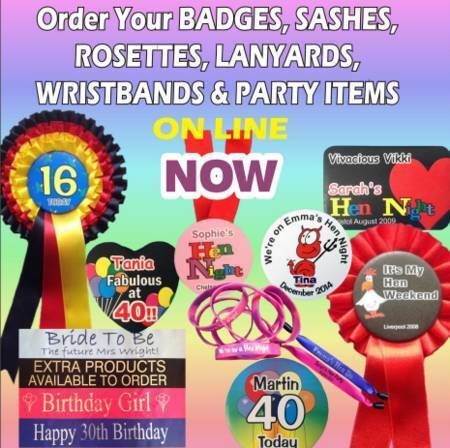 Any of the badge designs can be used as the centre for a rosette. You can choose the colour of the ribbon. 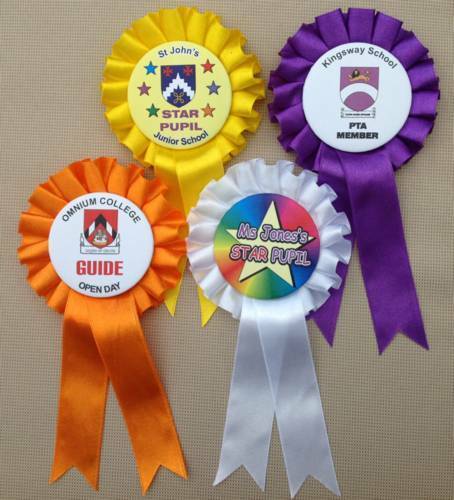 And if you are having more than a single tier rosette you can create a rosette that will match the school colours. Ideal if you want something that is a little more dominant than just a badge. Further information on rosette sizes and styles can be found here. For the increasingly popular Prom Nights, we can produce sashes for the Prom Queen and Prom King. Your choice of text, text colour, ribbon colour and font. And whether you have the text on the front and back, on just the front or just the back. The length is normally 6 feet, which suits most people. But if you need one for younger children or taller teenagers, then we can adjust the length. In addition the sashes are fastened with self adhesive fasteners. So you can actually adjust the length before the final fitting, to get the best fit. We can supply silicone wristbands - in standard size and also in smaller children's sizes. They can be printed or embossed with the school name and a contact number. This is perfect if the pupils are on a school event and get separated from the main group. They also identify them as belonging to an organised group, which again can be advantageous when on organised visits. Minimum order is just 25 but all text must be the same. 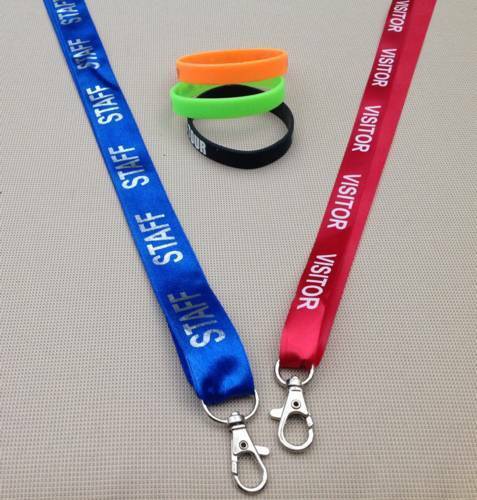 Ribbon lanyards can also be ordered - and here there is no minimum order. So the text can be different on all, and of course, you can order just one, with your choice of ribbon colour, text colour and font. Finally if the school has a chess club then via our sist er company we can offer great savings on hand made quality chess sets. Our school range or starter range is most popular, and for the more accomplished players or for competitions, we have a selection of weighted pieces in our Tournament sets. Finally if the school has a chess club then via our sister company we can offer great savings on hand made quality chess sets. Our school range or starter range is most popular. For the more accomplished players or for competitions, we have a selection of weighted pieces in our Tournament sets.